A big welcome and thank you to our sponsors this month! The Learning Fun with Felt line includes over 30 sets to inspire children's creativity and provides interactive teaching tool for parents, especially with their Learning the Bible in Felt sets. 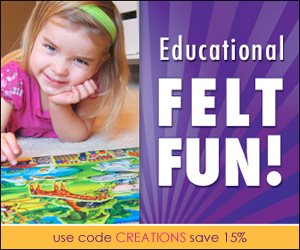 Use the coupon code Creations and save 15% on your order from Learning Fun with Felt. Newly revises and expanded, Educating the WholeHearted Child by Clay and Sally Clarkson is about much more than homeschooling; it is about life. It's an approach that is based on sound biblical principles of nurture, discipleship, instruction, and learning. Speekee is designed so that children can learn Spanish in their own time and at their own pace. Best of all, your first two weeks are FREE! Speekee TV includes 10 episodes with songs, animation and puppets filmed in HD, plus free downloads. My Grafico has some super-cute clip art and is the place that I first look for graphics. Their graphics and clip art packs are unique AND affordable ~ a great combination! Time 4 Learning is a convenient, online homeschool curriculum that combines education with interactive fun for grades PreK-8th. Time4Learning offers each child their own learning path, with animated lessons, unit assessments, and integrated printable worksheets for reinforcement. It’s not too late to get your school year organized with the Weekly Homeschool Planner ~ track testing results, evaluations and special events. Each of the pdf pages in the file can be typed in, edited, and saved to your own computer every time you use it. Personalize it to fit your family! We are fully enjoying the new schoolroom and still have a few loose ends to tie up to get it completely finished. Having our own space has been wonderful. The biggest aim is to cut out the bulk of tv time and finish reading some great book series that we’ve been reading as well as some audio series. We’re reading the Little House on the Prairie series along with some of the Imagination Station books and the kids are really enjoying them…so we’re going to keep it up! Stay tuned too!! I have some great giveaways, coupon codes and new printables to share with you all, including some more Before Five in a Row printables along with a Thanksgiving Printable Pack as well. There have been a few more things I have to share as well…just need to sit down and do it! What’s one thing that you really want to do this month? All About Learning Press ~ Spelling & reading programs that are easy to teach and easy to learn. We Choose Virtues….tools for inspiring character in children! Fall 2011 Curriculum Clean-Out Begins! !